it looks soooo pretty!! ^__^ i love the soft colours, and teh scan looks really pretty ^.^ keep it up! background is way too simple. teh text / formatting also needs to be redone. Very nice! And its ok to have a simple background, that way you forcus more on the angel. I love it! Its modest -claps- weehoo! Great job! such a pretty wall. I like whatever effect u did on the bkgd. Not bad for a first effort. Things you'll want totry for improvement in... The extraction could be better. The area around the top of her hair and her cheek are especially rough. I'd bet that her right forearm was one of the places you were doing some editing, it looks a little streaky. Lastly, I agree with the other commenter about the text. It doesn't blend very well with the rest of the wallpaper. Oh! She's my favorite Sister Princess character. 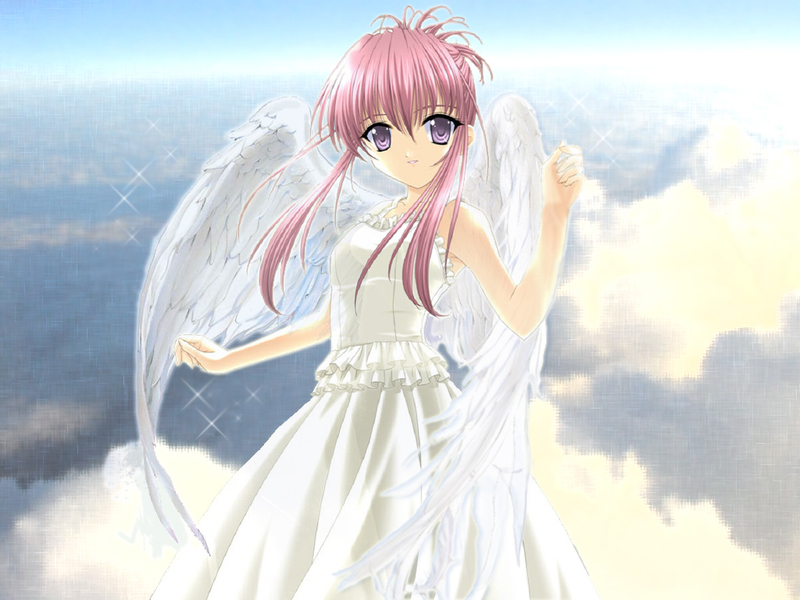 Love the angelic feel. ^___^ super!!!! Yay for another beautiful Chikage wallpaper!